Writer and literary historian Kim Roberts had been working on her most recent book, A Literary Guide to Washington, D.C., for years before she even knew she was writing a book. When Roberts moved to the nation’s capital 30 years ago, she began researching writers who had lived in the city in years prior. Roberts was disappointed at how few of these places talked about the writers who inhabited them, and began to map the lives of famous wordsmiths like Walt Whitman and Langston Hughes in their forays about the District. “I’ve always been really attracted to a sense of place,” Roberts explained in a recent interview, saying that documenting the places these writers lived and worked "made the city come alive in a new way." Her research cumulated in this pocket-sized guidebook to the city, a collection of spotlights on historic places related to D.C.’s cultural scene, accompanied by short biographies of writers connected to Washington and four walking tours readers can follow. The book represents an impressive cross-section of writers from a variety of historical periods, ethnicities, and backgrounds. While people don’t typically associate D.C. with an impressive literary heritage, Roberts reveals that there’s more to the city’s cultural past than first meets the eye. We’ve pulled a few places highlighted in the book to showcase some fascinating parts of Washington’s surprising literary history and culture. 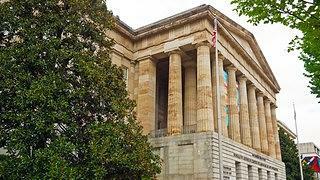 The National Portrait Gallery and Smithsonian American Art Museum building, formerly the U.S. Patent Office, was a frequent D.C. haunt of poet Walt Whitman during the Civil War. 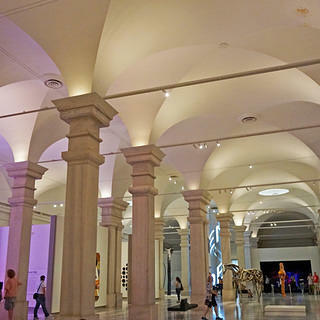 The National Portrait Gallery's Lincoln Gallery, which today holds contemporary art pieces, once held rows of glass cases displaying patent models--and masses of wounded Civil War soldiers, attended by the likes of Clara Barton and Walt Whitman. During a recent restoration project, the museum uncovered this Civil War-era graffiti on a window frame in the Lincoln Gallery, now preserved behind glass for visitors to see. 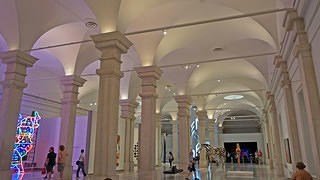 Not many people would associate the Smithsonian’s monumental art museum with America’s beloved poet Walt Whitman, but he spent a decade living in Washington, D.C. During that time, Whitman worked a series of menial clerk jobs, spending hours after work faithfully nursing the masses of wounded Civil War soldiers living in makeshift hospitals around the city, such as the one in what is now the National Portrait Gallery and Smithsonian American Art Museum. That massive Neoclassical building was originally the U.S. Patent Office. During the war, wounded men lay in between rows of glass cases containing patent models, where nurses like Whitman and Clara Barton would tend to them. 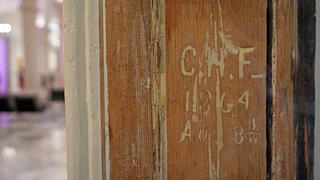 Graffiti soldiers carved into window frames is preserved under plexiglass today in the third-floor Lincoln Gallery. If you visit the building today, there are small signs throughout the third floor with information about a brief audio tour covering the building’s Civil War history that you can listen to on your cell phone. This memorial in historic Rock Creek Cemetery was a much-loved retreat for Gilded Age writer Henry Adams. 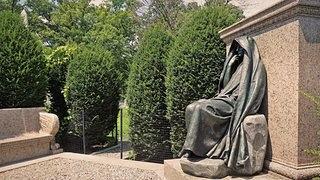 "Grief" has been widely praised as one of Saint-Gaudens' most profound pieces. The sculpture also has inspired countless poems over the years, which author Kim Roberts now collects. The memorial is surrounded by trees, creating a peaceful octagonal outdoor room, sectioned off from the world amidst the rows of gravestones. 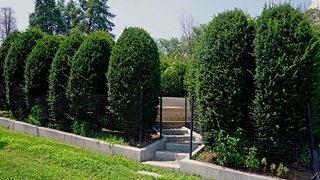 While Arlington National Cemetery, just south of Washington, attracts flocks of tourists each year, Rock Creek Cemetery is a hidden gem that lies rarely discovered in a sylvan spot in northeast D.C. Keen-eyed visitors may be able to spot a stand of small conifer trees forming an outdoor room around a marble platform. 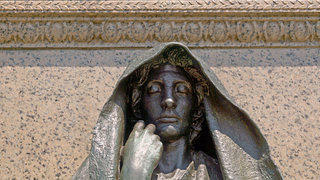 Inside sits a statue of a woman enveloped in a flowing cloak, the mantle pulled over her head, shielding eyes closed in an expression of strained serenity. The sculpture, created by Augustus Saint-Gaudens, is a memorial to author Henry Adams’ wife, Clover, who died by suicide in 1885. After sensationalist newspaper coverage of the tragedy, Adams, a four-decade Washington resident, historian, and writer of The Education of Henry Adams, requested that the sculpture not specifically resemble his wife or have any inscriptions on it. A copy of the sculpture can be seen on display at the National Portrait Gallery, but those in quest of the original can find it tucked away in Section E of Rock Creek Cemetery. Some consider the 1,500-seat Howard Theatre to have been the most important venue for jazz artists outside of Harlem, New York. 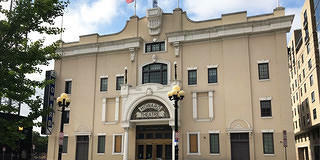 The 1910 Howard Theatre is symbolic of the significant African American cultural community present in the district during the time surrounding the Harlem Renaissance. According to Roberts, “The Harlem Renaissance was happening simultaneously in other major cities [besides New York]. What makes D.C. distinct [is that] there were neighborhoods where property was actually owned by people of African descent.” A significant African American middle class developed in the area, which in turn generated a notable cultural scene. One literary giant of the Harlem Renaissance, Zora Neale Hurston, author of Their Eyes Were Watching God, would have graced the theater's stage as a member of the Howard Players, which she participated in while attending nearby Howard University between 1919 and 1924. Hurston was very active at Howard University, joining a sorority and writing for the campus literary journal in addition to performing with the aforementioned college theater group. The Howard was the largest theater open to people of color when it was established, not insignificant in an age of segregation. In the 1920s, it became an extremely important venue for jazz artists, its stage seeing the likes of Duke Ellington, Ella Fitzgerald, Louis Armstrong, and Marvin Gaye, just to name a few. The theater was in good company at that point: The nearby Lincoln, Dunbar, and Republic theaters made the neighborhood a bustling cultural district for Washington’s black community. The theater also pioneered to concept of “amateur nights,” later copied by New York's Apollo Theater, allowing countless young artists to have a chance at performing in a large venue for the first time. The Howard was re-opened in 2012 after decades of closure, and still operates as a music venue today. D.C. wasn’t completely unkind to Hughes, however: In 1925, while working as a hotel busboy, Hughes took a leap of faith and handed three of his poems to already-famous poet Vachel Lindsay, who was dining in the hotel restaurant. Lindsay had Hughes written about in the newspaper the next day, one of Hughes’ first times being significantly publicized. 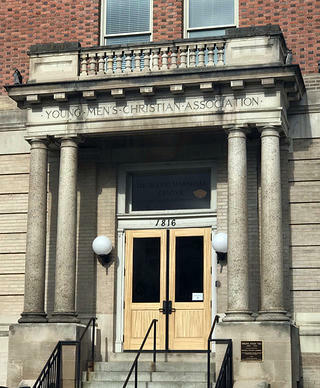 The 12th Street YMCA was completed in 1912 at a time when African Americans were not allowed to take part in the mainstream YMCA, offering amenities such as a pool, gym, offices, and event rooms. The "Twelfth Street Y" offered all the amenities of a YMCA to the local African American community. Hughes rented one of the building’s 54 small boarding rooms while working to get his writing career off the ground. In 1926, Hughes released his first book of poetry, The Weary Blues, before leaving D.C. to attend university. Today, literary pilgrims wanting to follow in Hughes’ footsteps can ring the building’s doorbell during regular business hours on weekdays to see a few rooms inside restored to their historic appearance.